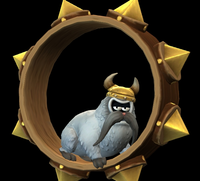 Lemmingtons are members of the Snowmads and enemies that appear in Donkey Kong Country: Tropical Freeze. The Prima Games guide refers to them as "deranged hamsters," presumably due to their hamster wheels. Their name comes from their species combined with the name "Remington," which their Japanese name can be translated to. Lemmingtons run around in their spiked hamster wheels, which they attempt to roll into the Kongs with, similar to the role of millstone-riding Gnawtys in the first Donkey Kong Country. The Lemmingtons cannot be defeated via normal means except with Cranky Kong's Cane Bounce. Similarly, the Kongs can stun them with a Ground Pound, and if they are upside-down, they fall down when stunned. Unlike other Snowmad species, the Lemmington species does not have any derived species. This page was last edited on April 18, 2019, at 17:09.